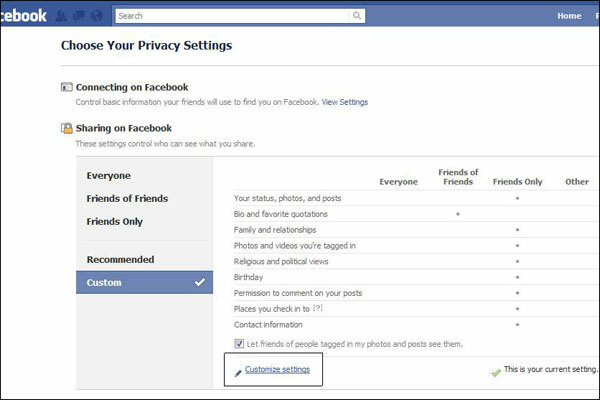 You have to love Facebook, but it's a good idea to stay on top of your Facebook privacy settings. Here's a new privacy setting to be aware of: Facebook is implementing facial recognition to automatically suggest people's names to tag in photos based on very powerful facial recognition software. 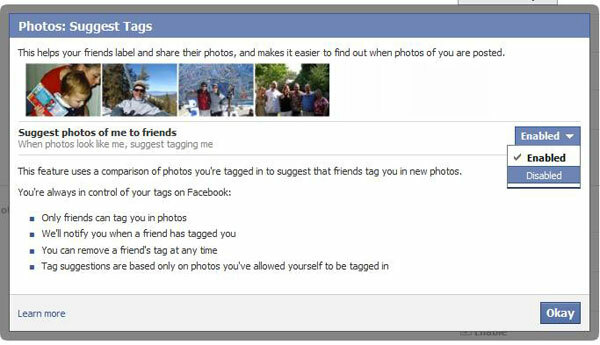 See the instructions below to change your privacy settings to prevent automatic tagging of your face (or what Facebook believes is your face) in other people's photos. Facebook's software will scan through billions of faces in all the tagged and untagged photos of its 500-million+ users in order to make it easier for people to apply tags to their photos. Very amazing technology! However, from a privacy standpoint, many people don't like where this is heading. There are lots of good reasons for not loving "automatic facial recognition" in photos uploaded to facebook and other websites. The biggest reason being that it is a step towards eroding everyone's privacy. For example: If your face is automatically found in a photo that was taken at a particular event, Facebook knows that you were at that event (whether you like it or not) without anyone voluntarily providing that info. Google (who's code of conduct still includes the words "Don't Be Evil") recently opted to not apply it's facial recognition technology to allow "face-based" searches using cameras built into smart phones..That's a relief! (For more info, read this CNN article ). (Step 1) Log in to your Facebook account and click the "Account" drop-down link in upper right of Facebook page. From the drop-down menu, choose "Privacy Settings"
(Step 4) Once you find the "Suggest Photos" option, click on the drop-down menu to switch the feature from Enabled to Disabled. Then, click on the "Okay" button.